I went to a Jewish synagogue once. There were a lot of guys reading a book. The book was in front of the guys. They took it from an altar in front of them and they read it in front of them, of course. They were reading God's Word. And at the same time, the women were present, yes present, sitting in the wings. In the synagogue that I went to the women were sitting on the left hand side (maybe this is only a feature of the one synagogue that I have been to, in Edinburgh). This structure is similar to that proposed by Freud as the structure of the self. While the self seems to be directed forwards, an "acoustic cap" or super-ego, listens on the left hand side according to Freud. The Japanese do not have synagogues, or even churches or any places of communal worship where they congregate, much. 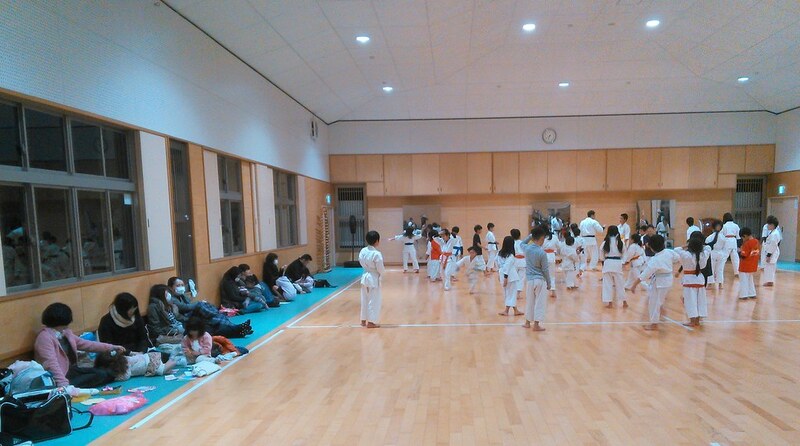 But they have martial arts training rooms (Dojo) where the mothers sit and watch from the side (as shown above) or behind. In front of the Japanese men there is no book, but instead mirrors. The practioners do not read themselves from a book in front of themselves while women listen from the side, but see themselves in mirrors in front of themselves while women watch from the side and behind. And so it I think is with the Jewish and Japanese mind.